September 14, 2016, Parañaque City. 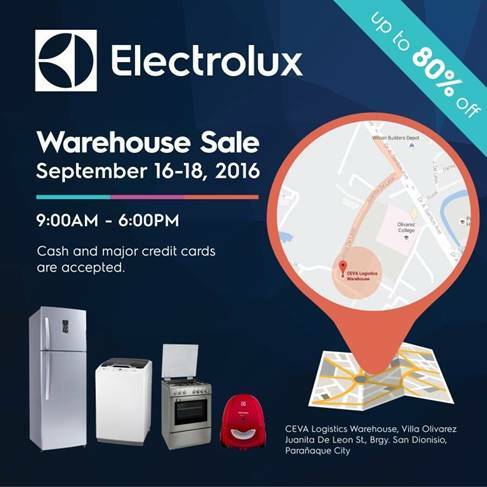 Save as much as 80% during the Electrolux Philippines warehouse sale on selected appliances from September 16 to 18, 2016 between 9:00am to 6:00pm at the CEVA Logistics Warehouse, Villa Olivarez, Juanita De Leon St. Brgy. San Dionisio, Parañaque City. Cash and major credit cards are accepted as payment. For any inquiries, contact Tony of ComCo Southeast Asiavia email at anthony.quijano@comcoglobal.com or call / send an SMS at 09279261131.